Poop soup. That’s how our AMBUCS adventure begins. Just beyond the awesome playground equipment, there is a wastewater treatment plant. Stay with me — I promise it gets better. The large vats of poo, presumably, have a piece of metal that goes around and keeps the sewage moving. They look like pots of soup being stirred with humongous ladles. So, on our playdate my sister-in-law and I concocted a story about “poop soup” to entertain my son and nephew. It worked. 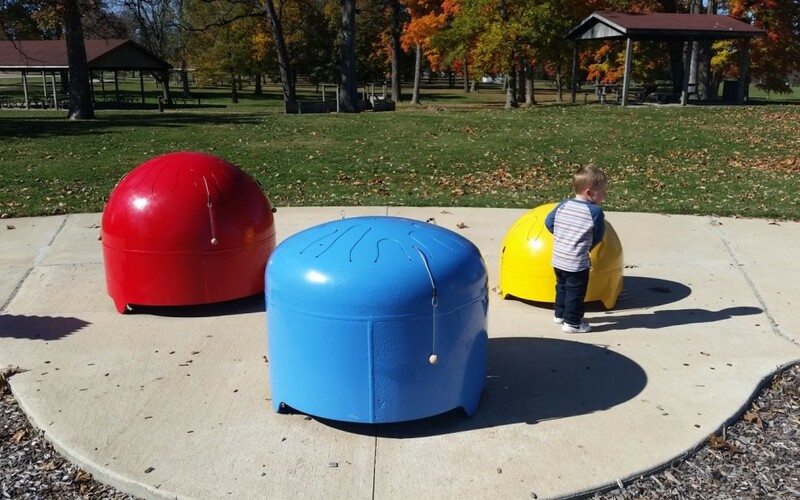 Even months later when we go to this Chambana Park to Know at 1140 E. University Ave. in Urbana, my son first runs across the field to look at the huge pots of “poop soup.” Don’t worry: He always makes his way back to the playground because it’s just that enticing. This playground is situated on 22 sprawling acres of land. There is a lot of room to run and play here. AMBUCS Park is on a site leased from the Urbana-Champaign Sanitary District in 1960. Don’t let the whole poop soup story deter you. I’ve never had a bad whiff while I was there unless it came from my own son (yes, still not potty trained). In September 2013 a new, accessible playground was introduced to the community here, hence the AMBUCS name. AMBUCS is an organization dedicated to creating mobility and independence for people with disabilities. With these accessibility updates, children of all abilities have the opportunity to play here. You can see the park’s accessibility features with the use of wide ramps and belted, plastic swings. Watch out for the closing latch on the modified swings. They can come down fast. The park’s main attraction is the large structure built to resemble a ship. This piece features a tunnel, bendy slides, a swirly slide, dueling slides, climbing walls and bongos. The structure isn’t scarily high off the ground, so I never felt like I had to hover over my son as he played. In my opinion, walkers to age 10 would find enjoyment here. Have a train lover? This wooden train play structure will delight. Photo Credit: Emily Harrington. There are accessible and kid-sized swings in front of the massive ship. They are surrounded by overturned logs to sit on or jump on. But, there’s more. A lot more. There’s just a lot of room here, and everything to look at and play on is nicely spread out. Behind the ship you’ll find the bucket swings for toddlers and a train your kiddos can pretend to drive, the AMBUCS Express. But don’t forget to stop at the ticket booth first and blow the train whistle. Beyond the train are the INDOOR BATHROOMS! But they are closed from Octoberish to Aprilish. However, they do have a portable potty by the large parking lot for your convenience. Same goes for the water fountains; they exist but are turned off in cooler weather. Just past the indoor bathroom is a baseball diamond. Take a left at the diamond and you’ll come to a bridge with a wood boat to play in underneath. Just another unique element to the playground! I’ve saved the best for last, though. Toward the playground’s side where the boat lives, there is a series of oversized musical instruments. An upright set of pipes, three xylophones made of different materials and three drums are available for play. They are all kid friendly and make the neatest sounds. The park has mature trees, benches and pavilions scattered around with a grilling area. I heart this park. I know I say this about a lot of parks, but I have a soft spot for this one in particular. We came to AMBUCS Park a lot when my son was just beginning to walk. We spent many summer nights playing those bright-colored drums and listening to the train whistle together. Visit soon. You can spend an entire afternoon here exploring all this park has to offer. Emily Harrington is a Chambana townie that left her 8 a.m. to 5 p.m. job to be a 24/7 mom to a dreamy son. Still interested in writing, Emily uses some of naptime to practice her passion and keep her mind right. Emily is a happy wife with a happy life, because she fell for a fellow townie. Oh, and let’s not forget her other son—a degenerate canine named Heppenheimer.